Cob Stone near Grey Stones Lane, Far Slippery Ford, west Yorkshire. OS grid reference: SE 00549 40890. 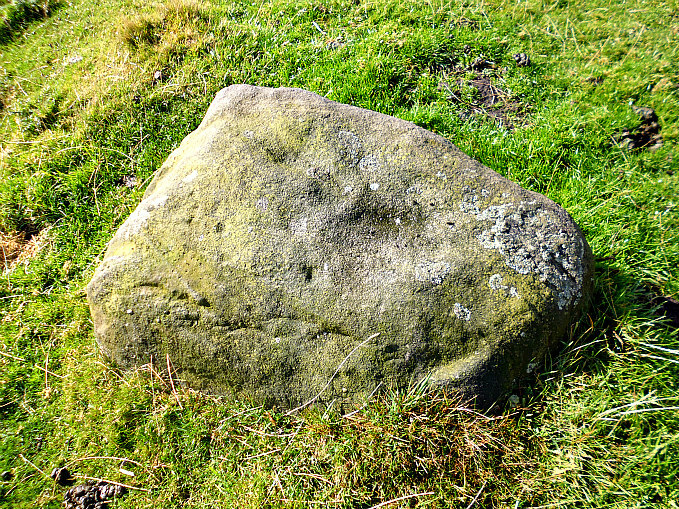 In a field beside Grey Stones Lane and below an outcrop of rocks called Grey Stones Hill, near Far Slippery Ford, west Yorkshire, is a gritstone rock that is locally called Cob Stone. Whether it takes its name from a small round loaf of bread, or some-thing else, I don’t know with any certainty, but I am also told that the word “Cob” means ‘Devil’ in this part of the country, so it could mean “Devil’s Stone”. The rock has a cluster of quite well-defined cup-marks on top and maybe a few fainter cups-marks lower down. To reach the stone you can take the footpath going east from Long Gate Lane at Far Slippery Ford. This will bring you to the bottom of the field. Other than that, you could see if the wooden gate opens on Grey Stones Lane next to the track going down to Grey Stones Farm. If it opens, then please make sure it is secured after entering, and on going back out again! 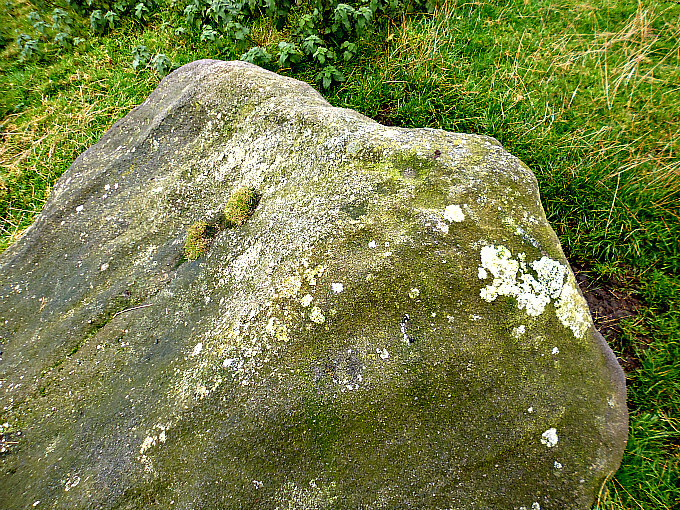 Cob Stone, beside Grey Stones Lane (cluster of cup-markings). 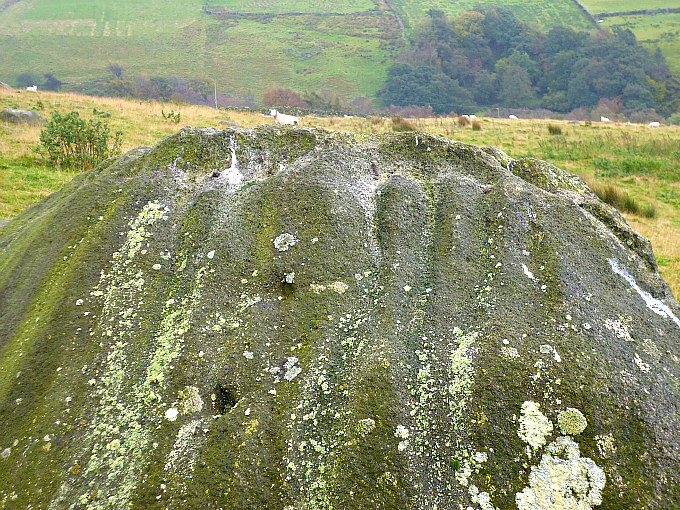 Large boulder near Cob Stone (with “possible” cup-markings). Cob Stone or Devil’s Stone is a glacial erratic gritstone rock that was deposited by a retreating glacier many thousands of years ago at the end of the last Ice Age. On top of the stone there is a cluster of 7 or 8 small cup-marks and further down a few fainter cups can just be made out. However, these faint cup-marks might have been caused by erosion – it’s often difficult to tell one way or the other, and the rock itself is now very smooth on its side due to thousands of years of weathering. Some 68m to the south-west there is an even larger boulder; maybe it’s another Cob Stone?, and this is indeed roughly shaped like a loaf of bread! This large boulder looks to have a few cup-marks on top and on its side, or are these due to erosion? And there are a few other rocks in the same field that have “possible” cup-markings; it’s just a case of walking around and looking closely at the many small and large rocks, and there are indeed “many” to look at. 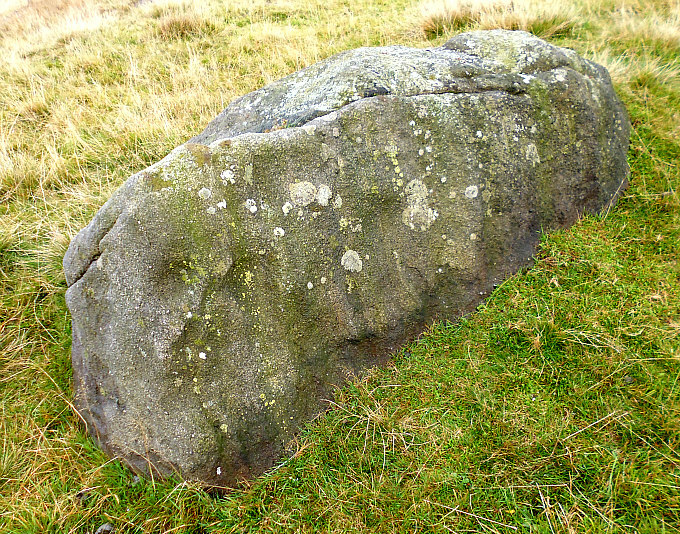 Cob Stone is recorded in Boughey & Vickerman’s 2003 survey. 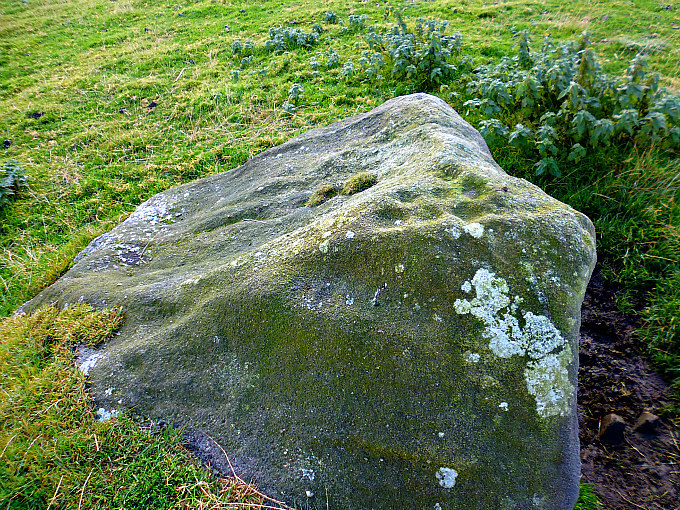 Cup-Marked rock in the field near Cob Stone, Grey Stones Lane near Far Slippery Ford. Categories: Cup-Marked Rocks, Glacial Erratic | Tags: Cob Stone near Far Slippery Ford and Newsholme Dean in West Yorkshire | Permalink.